"Reading your letters, I recall your face and long for the days gone by." These words surfaced during a viewing of objects from the Japanese Special Collections at Leiden University Libraries in December 2017. Hidden away in the files of Leiden University’s first professor of Japanese and Chinese Studies Johann Joseph Hoffman (1805-1878), this find turned out to be the very first letter by Kusumoto Taki, or Sonogi (1807-1869), the Japanese wife of Japan scholar Philipp Franz von Siebold (1796-1866). Sonogi’s letter was written about a year after Von Siebold’s forced departure from Japan in 1829. The letter is approximately 3.4 meters long, signed ‘Sonogi’ and dated December 25, 1830 (11th day of the 11th month of the year of the Tiger [13th year of the Bunsei period], according to the traditional Japanese calendar). This makes it the first letter that Sonogi sent to Siebold after his forced return to The Netherlands in December 1829. The letter was probably written by one of Sonogi’s female acquaintances and sent with one of the Dutch ships that left Nagasaki on January 1, 1831. Several more would follow throughout the years to come. In her letter, Sonogi thanks Siebold for letters that he sent from Batavia and a nearby harbour earlier that year. She expresses her feelings of heartache and tells him that their young daughter Ine (1827-1903) asks after her father. Sonogi mentions several gifts she sent with her letter. These include two snuff boxes with portraits of herself and of Ine. One of these boxes is currently in the possession of the National Museum of Ethnology in Leiden. Sonogi thanks Siebold for the money and the presents he sent. The gifts and the money are also mentioned by Siebold in his letters of March 1830. We found Sonogi’s letter in the files of Leiden University’s first professor of Chinese and Japanese Studies, Johann Joseph Hoffman (1805-1878) in December 2017 during a meeting of the Netherlands Association for Japanese Studies. The four parts of the letter were squeezed between Hoffman’s sketches of Korea and labelled Japanese ‘writing samples.’ Having joined a summer school on early modern Japanese palaeography at the University of Cambridge earlier that year, Aafke van Ewijk recognized the specific writing style as a women’s letter and that same evening was able to decipher the words “Ine understands everything and asks for you all the time, which makes my heart ache even more.” Ine was the name of Siebold’s daughter, and this passage suggested a letter sent by Siebold’s Japanese wife? With the help of visiting scholar Miyazaki Katsunori, we were able to establish that this is a hitherto unknown letter. Sonogi’s actual name was Kusumoto Taki (1807-1869) and she was among the category of Nagasaki prostitutes that were ‘assigned’ to the Dutch men on Deshima. Siebold’s daughter Kusumoto Ine, or ‘O-ine,’ followed in the steps of her father and became the first female physician of Western medicine in Japan. She is the subject of several Japanese TV-series, manga and a recent musical. Sonogi had come to Siebold from the entertainment district Maruyama, in an arrangement that was at the time not unusual. Prostitutes known as ‘they who visit the Dutch’ (oranda-yuki) could enter into prolonged relationships with Dutch patrons on the artificial island of Dejima in the Nagasaki harbour, to which the Dutch were confined. In the case of Sonogi and Siebold this seems to have developed into a relationship, unequal as was, of genuine affection, at least initially. Sonogi hurriedly put together her first letter to Siebold, as the next Dutch ship for Batavia would leave only a couple of days later, on January 1, 1831. Presumably she borrowed the writing skills of a female acquaintance, as other extant letters all have different handwriting. Siebold was not able to read the original letter, and a translation into Dutch was provided by one of his students. When and with what purpose Siebold gave Sonogi’s letter to Hoffman is still a mystery. His emotional attachment to this letter probably waned over time, as both married different partners. Sonogi mentions in her letter that she received ten kan silver (1000 tael) from Siebold in alimentation. Siebold’s successor Heinrich Bürger (1806?-1858) and the painter C.H. De Villeneuve took care of delivering the money. Ten kan silver amounts to about 130.000 euro and was in 1830 sufficient to buy a house in Nagasaki (according to a letter by Bürger to Siebold in which he describes that he bought a house for his own family for the same amount of money). Sonogi and Ine moved initially into her uncle’s house and Sonogi entrusted the money to this uncle. Apart from money, Sonogi confirms to have received several gifts: fabrics, rings, hairpins, a comb made of tortoise shell, and thimbles. She does not fail to point out a practical problem: from the pieces of cloth she received, three are missing. Sonogi warns Siebold to be more careful next time. Siebold’s acquaintance ‘the painter’ (C.H. De Villeneuve) will be able to tell more about it, she adds. Who the culprit is, is unclear but obviously someone was taking advantage of the situation. As mentioned earlier, Sonogi herself also sent several gifts: These include two snuff boxes with her own and Oine’s pictures. The box showing Ine’s portrait is currently in the possession of the National Museum of Ethnology in Leiden. Unfortunately, the image is damaged. The box showing Ine and Sonogi respectively on the inside and outside of the lid is in the collection of the Narutaki Siebold Memorial Museum in Nagasaki. Although the first snuff box was intended as a present for Siebold’s mother, it is unclear whether Siebold ever introduced his daughter to her. The reputation of Siebold as a major figure in the unlocking of knowledge pertaining Japan in the early nineteenth century is extraordinary. However, his more private experiences in Japan are still relatively obscure. This unique find helps to shed some more light on a very personal connection between a scholar and the country that would make him famous. 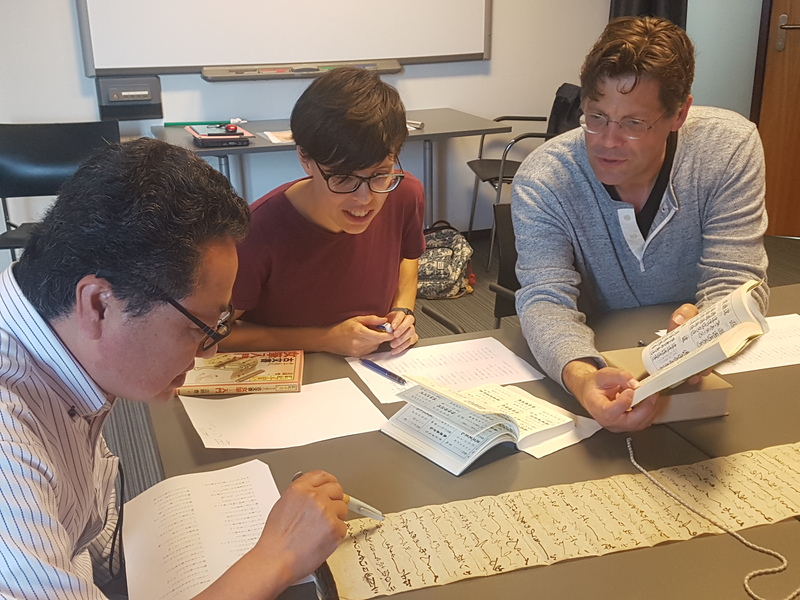 Japan Museum SieboldHuis in Leiden will host an exhibition surrounding Sonogi’s letter in summer 2019. Thank you for your three letters of March four, seven and fourteen. I am delighted to hear that you are in good health. Oine and I are also well. I was worried about the sea trip, but it reassures me to hear that you arrived safely [in Batavia]. For many years we were bound by a mysterious fate until increasingly worrisome events caused you to return last year. There is no day that I do not weep. Reading your detailed letters, I recall your face and long for the days gone by. As I can no longer see your face, I imagine that your letters are you and I cannot forget you a single day. Moreover, Oine understands everything and asks for you all the time, which makes my heart ache even more. Oine also keeps asking about Orson every day and she reminds me of you even more. Please imagine how I feel. Furthermore, I will never forget what you wrote in your letter. Please don’t worry about Oine and myself and rest assured, as my uncle takes care of us. There is really no need to trouble yourself. The only thing I wish for is that you can live in good health. We worry about you in the same way that you worry about us. I ponder every day why we met with such a fate. Again, please don’t burden your heart with our situation and I will devote my prayers to your health. Besides, I really appreciate what you wrote in your letter. Item. I am happy to hear that your mother is well. Please give her my regards. I imagine she must have been very worried all those years you were in Japan. Item. Thank you for all the presents. I won’t forget the favour to receive presents from such a faraway country. I can confirm that I received the amount of ten kan silver. I thank you from the bottom of my heart for sending this to us from over the far mountains and the sea. Item. I would like to present a snuff box to your mother. It is decorated with Oine’s picture. It looks exactly like her. Please convey this to your mother. Item. To you, I also present a snuff box. It is decorated with both the pictures of myself and Oine. They are faithful portraits. Please look at the box every morning and evening and think of it as Oine and me. Item. I am relieved to hear that Orson is well and recovered from his illness. Please give him my regards. I sent him twenty rolls of tobacco, a pair of geta (wooden clogs), a pair of zōri (sandals), and a tobacco pouch. They are just some souvenirs. Item. I understand Higatohen [unclear who Sonogi refers to] is well, please give him my regards. Item. I must repeat that I hope you will live in good health. We do the same, please be assured. From the thirteen pieces of fabric that you sent me I received only ten. Three pieces are missing. Please be careful in the future, even if you would send just some small items. I spoke about this to the painter [C.H. de Villeneuve], so please ask him for the details. I am greatly indebted to him, so please thank him. I am also much obliged to Mr. Naonosuke [the translator Matsumura Naonosuke] and Mr. Ryōsai [Siebold’s student Kō Ryōsai]. Please write some words of thanks to them in your next letter. Lastly, I thank you for the presents of seven rings, three hairpins, one comb made of tortoise shell, and ten thimbles.